Where to go when you want that casino steakhouse experience without having to go all the way to Las Vegas? Why, San Manuel Indian Bingo and Casino in San Bernandino County, of course! 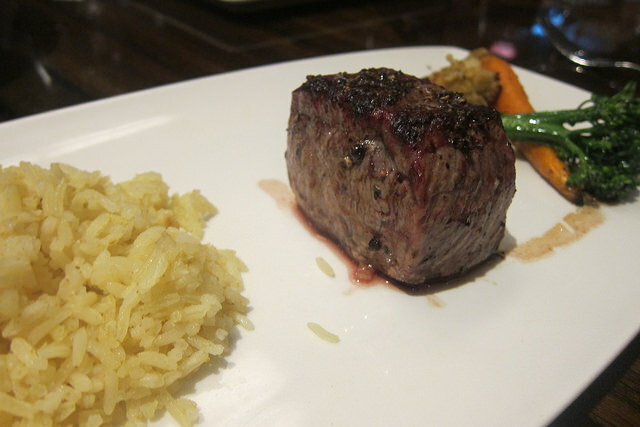 We were invited to the steakhouse, The Pines, for a truly fun experience. I had never been to an Indian casino before and was pleasantly surprised to find a large and recently renovated casino. 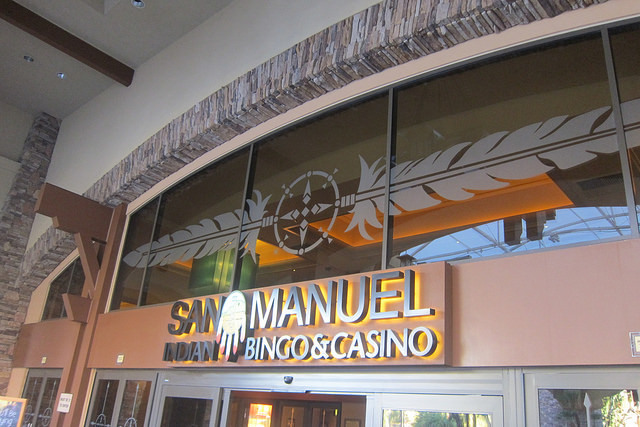 San Manuel claims to have more gaming tables than the Bellagio in Vegas and I thought they had a ton. The bingo hall is huge and doubles as an concert hall. There’s a small food court area including a buffet but we were there for the steakhouse. We started off with a round of drinks. I was delighted to find the menu lights up which is helpful when the restaurant flips to a nightclub later in the evenings. I was hesitant about the Maximus which featured two types of chiles but it turned out to be very pleasant as the honey and peanut butter toned down the kick. The rich house made coconut cream was delightful. It felt super tropical. I suspect as the seasons change, The Stone Age won’t be available for much longer with stone fruit so be sure to ask about the daily offering. 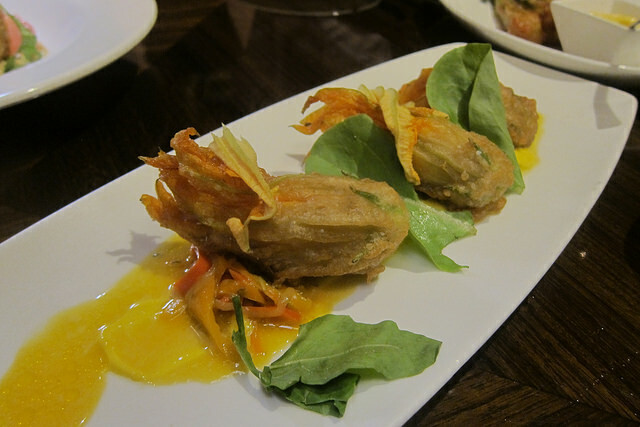 Under small plates, we chose the halibut brandade stuffed zucchini blossoms. This was great as an appetizer. 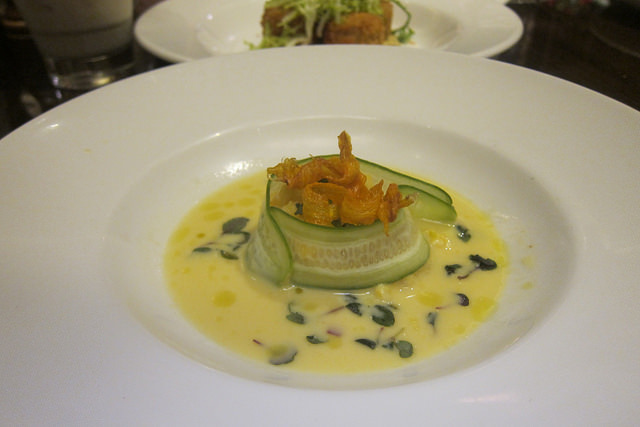 I love brandade and it was marvelous to stuff the fish into the flowers. 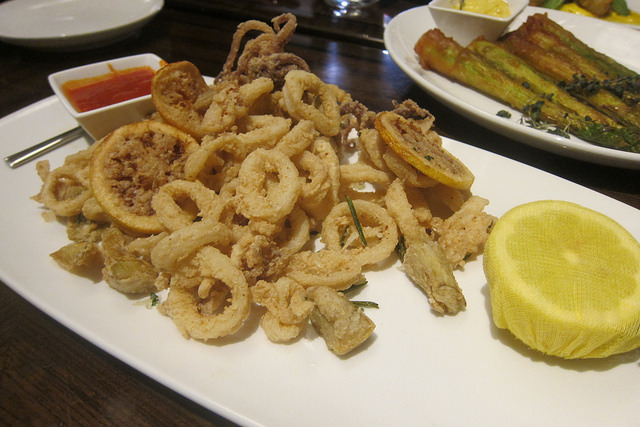 The calamari fritto was one of the recommended dishes. The seafood is lightly battered and fried which was very nice. 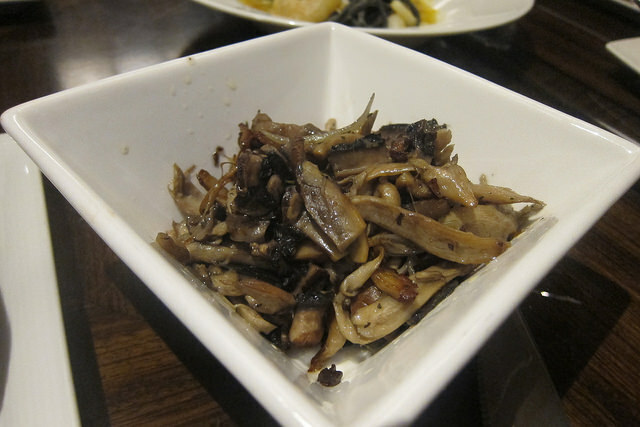 I also enjoyed the bits of artichoke hearts. The crab cakes were great. I really liked the Creole remoulade and grapefruit salad. 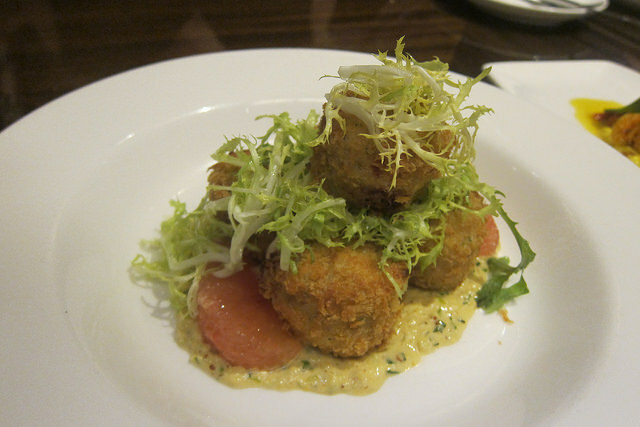 The crab cakes are smaller but you get more of them so they’re easily sharable with a group of friends. The crown jewel of the appetizers are is the fruits of the sea assortment. 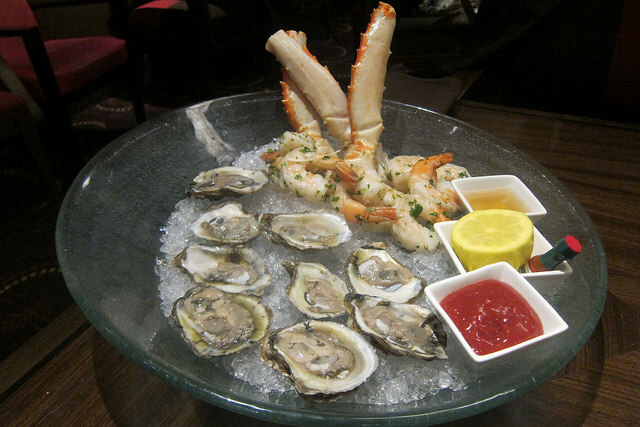 You get a mix of oysters, shrimp cocktail and red king crab legs. Everything was fresh and delicious. The shrimp are massive! 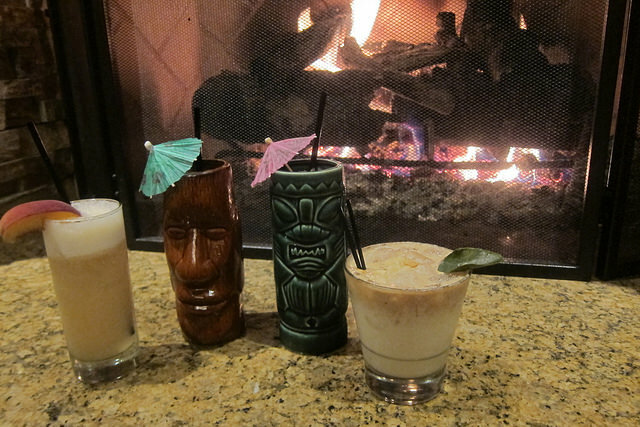 There are three tiki-style drinks on the menu at The Pines. We ordered two of them and I liked the S. S. Minnow. 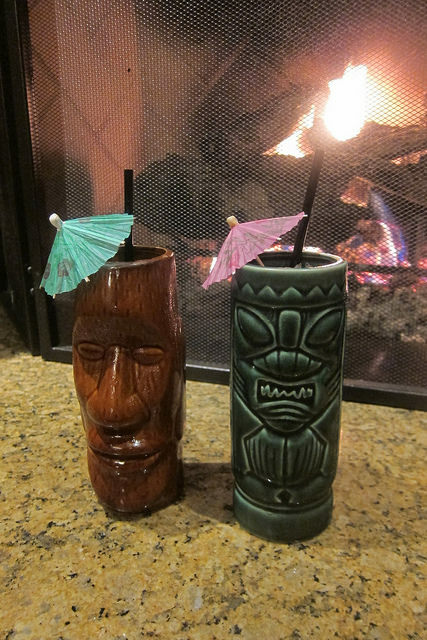 I loved that they came in tiki mugs. So much fun. Now if there was only a pool to lounge around at with these drinks. We went family style on the entrees and shared everything from squid ink pasta to steak to lamb. For those who are vegetarian, I would suggest asking for an off-the menu meatless pasta with vegetables. 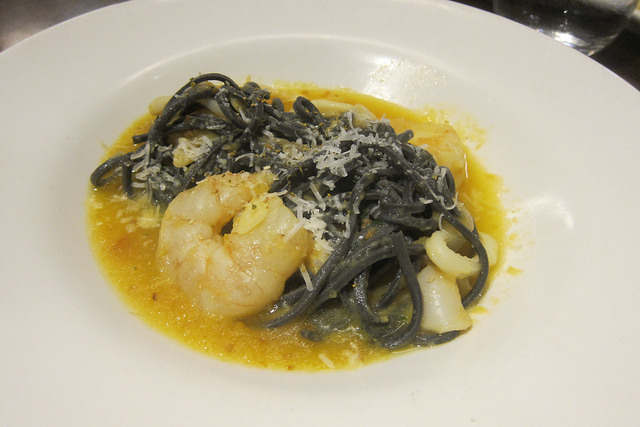 But if you’re a seafood nut like me, the squid ink pasta is great. I really wanted to know where The Pines was sourcing their shrimp as they were so very plump. 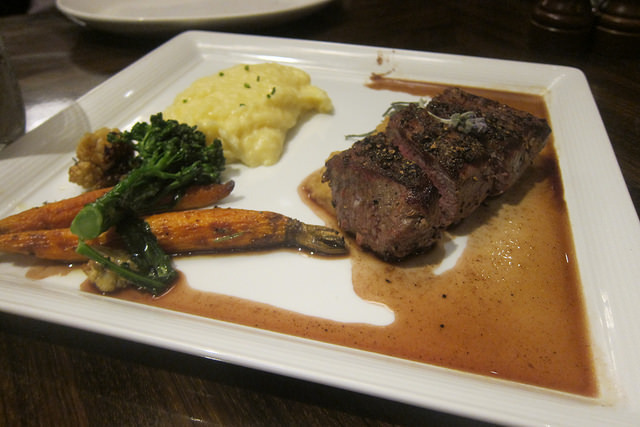 We tried two types of steaks; the New York Pave and also the bone-in ribeye. The NY Pave is dry aged and at 6 ounces, was a good portion for one person. 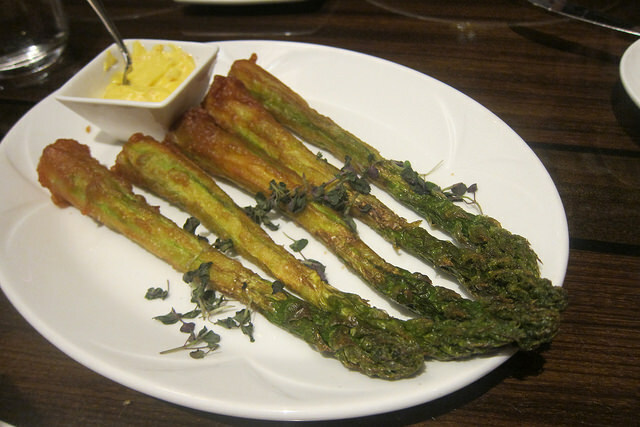 The tempura asparagus are under appetizers. They are served with a red pepper and aji amarillo aioli. There’s something about steak dinners that require me ordering a side of mushrooms. While happily stuffing my face with beef, I tasted a bit of the rack of lamb. I prefer mine just a tad more rare but it was still tasty. It came with a black olive wine sauce that was very interesting. I can’t help but love all the old fashioned sides at steak houses. Bring on the cream vegetables. 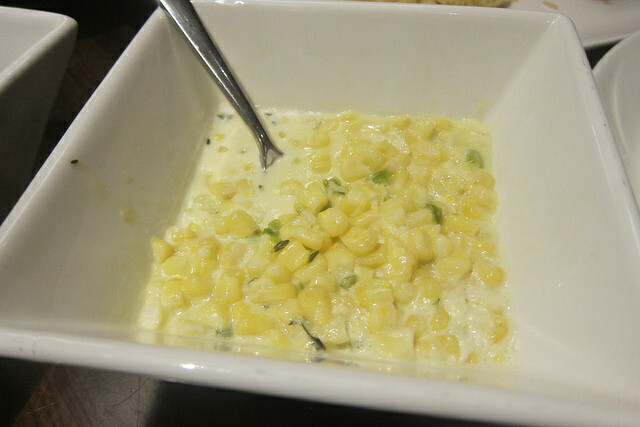 The creamed corn was a good portion as a side. Maybe it’s time to go jogging after dinner. But it wouldn’t be a steak dinner without the sides. 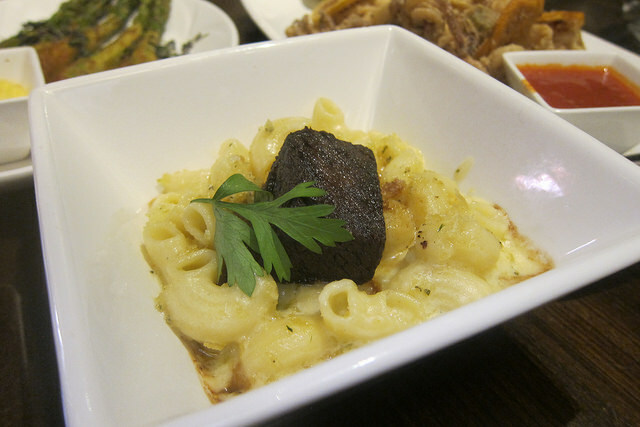 Also under the small plates, we nabbed the short ribs mac and cheese. I could eat this as a side since I would find it difficult to share that small chunk of short ribs. 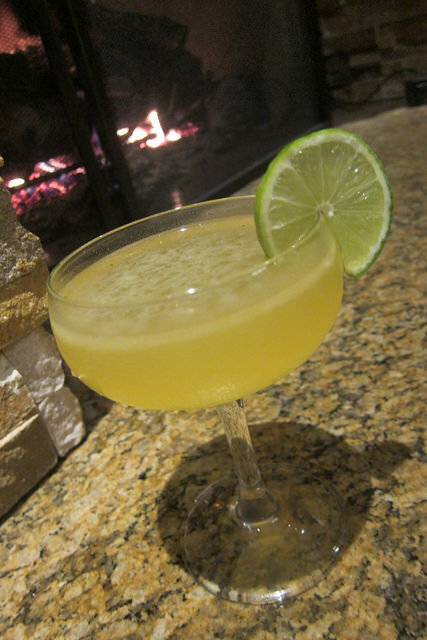 Here’s a take on a Hemingway daiquiri, add in turmeric infused-Mount Gay rum and a bit of kaffir lime for an even more tropical/Asian twist. 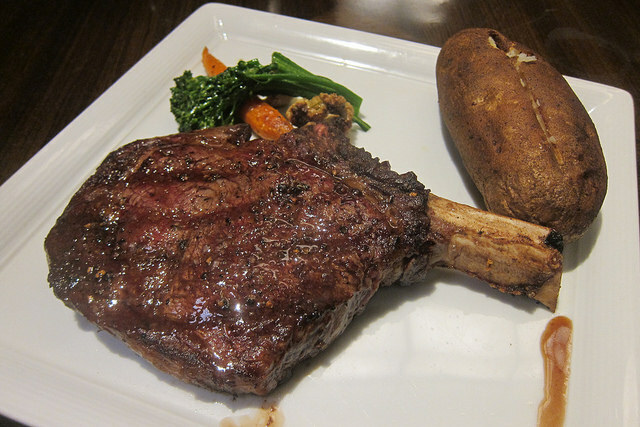 They were out of the dry aged bone-in ribeye for two (26 oz) but the regular bone-in ribeye is no joke at 20 ounces. This was a perfectly juicy, thick steak. I shared with others and I think this would be an ideal substitute if the steak for two wasn’t available. We got a baked potato as the side. When I was a kid there was a baked potato place I would go to (this food needs to be trendy again) where I just loved loading up my potato. I was in that gleeful state slathering on the butter, sour cream and chives. When I portioned out the potato, I even added a bit of mushrooms to my spud. We went surf and turf and added a side of scampi. Again, just marvelous shrimp. 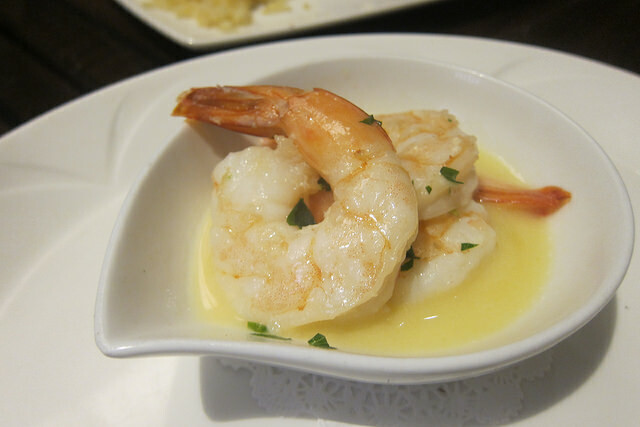 And such good garlic and butter sauce. I was seriously clutching my stomach and silently rejecting dessert. But naturally no one can hear a silent protest so three desserts came out. I had a spoonful of each. 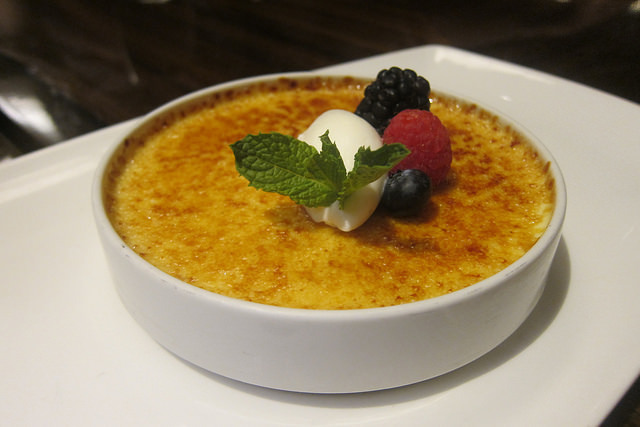 My favorite was the creme brulee but I also liked the ice creams. 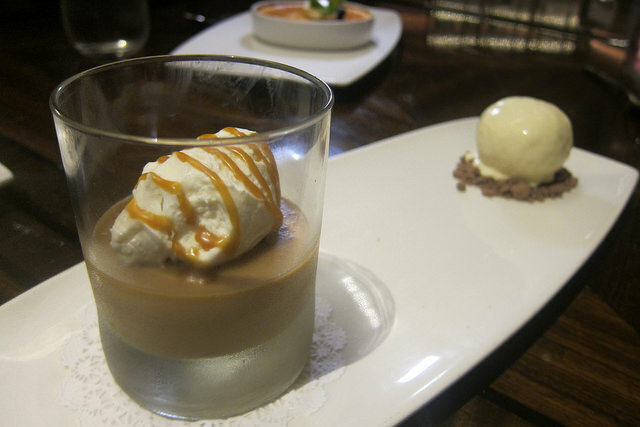 The Pines does a good job with the butterscotch pudding (budino!) with a smoked vanilla bean ice cream. 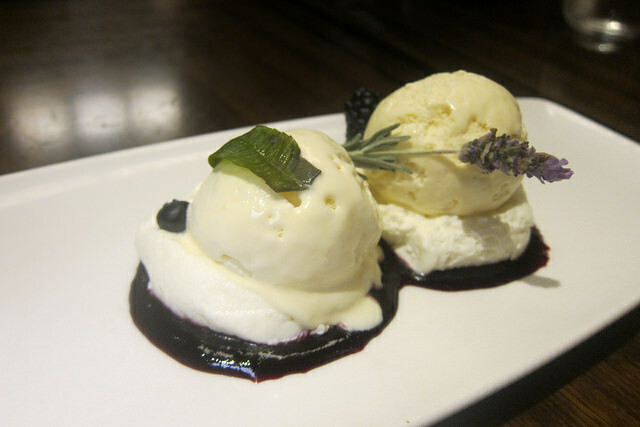 If I had chosen a dessert, I most likely would have gotten something simple like the semifreddo duo. The lemon verbena was quite refreshing. The next time you’re on your way to Vegas or instead of driving all the way to Vegas, stop by for dinner after a battle with the one armed bandits.